Synopsis: It's the fourth Skulduggery Pleasant adventure! only Skulduggery Pleasant himself is lost on the other side of a portal, with only some evil gods for company. Can he possible survive? (Yes, all right, he's already dead. But still.) What can we say, without giving too much away? Not much, is the answer. But what we CAN say is that this book is hilarious, it's tense, and it's packed with all the eye-popping action, crackling one liners and imaginative set pieces you've come to expect. There's a new threat to our plucky heroine, of course. But that's not all. There's also the little fact of the Big Bad, the uber-baddy who's going to come along and really, really destroy the world. (Really.) And what we learn about that villain in this book will literally make your jaw fall off and your hair go white with shock. (Not really.) Will Skulduggery make it out of the Faceless Ones' dimension? Who knows. The problem is, he may not have much to come back to! Now on their fourth adventure, Skulduggery Pleasant and Valkyrie Cain continue vanquishing evil to protect everything they love. Now battling against the bad guys who seek their own personal revenge, things get tangled in an onslaught of hidden motivations and villainy. 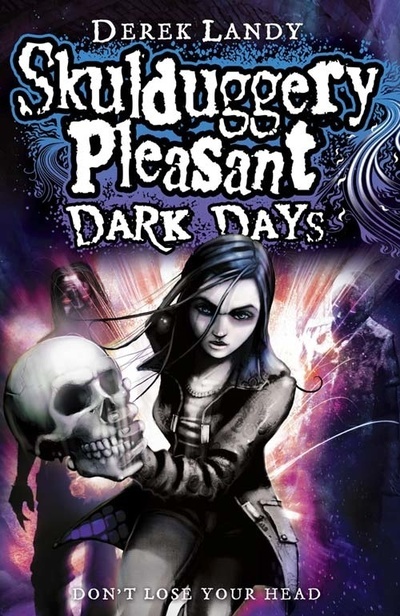 After the intrepid escapades of Valkyrie and Skulduggery in The Faceless Ones, Dark Days continues to improve on what I thought was the best novel in the series. Dark Days is what all the Skulduggery books should have been like: witty and unpredictable, with plenty of action and magic. Dark Days returns to the sarcastic humour of the first book, presenting Skulduggery in an almost Sherlock Holmes-esque way, which I thought was an interesting take. One of the most improved areas of Dark Days is probably the character development. I realise that a book aimed at the teen/pre-teen market does have high priorities in the personality department, but I can appreciate all that Derek Landy has done to Skulduggery, and, to a lesser extent, a host of other characters. Dark Days reveals Skulduggery’s darker side, something that’s been hinted at quite heavily in the last few books, but hasn’t come truly to light. This unseen side of Skulduggery is ruthless, angry and unforgiving, and it really fleshes him out as a character. Valkyrie, too, benefits from some additions, except this is in the form of a romantic relationship (eep!). While this has also been hinted at for a while, it’s nice to see something actually happening! Sadly, this doesn’t come in time for quite a big loss, and as such the reader isn’t affected as much as we should be. What I like about Dark Days the most though, is the reintroduction, or should I say, the higher concentration of Skulduggery’s jokes. The Faceless Ones saw much of the witty banter fall away, which was a real shame as it is the heart and soul of the series. In this fourth instalment, Skulduggery’s jokes are better than before, and genuinely had me chuckling! Story-wise, Dark Days is, again, moving in the right direction. With enough action to keep young audiences interested, but also some calmer parts, Dark Days delves into the grittier element that was introduced in The Faceless Ones: the idea consequences, which was something that was lacking from the first two novels, and something that didn’t make them quite as realistic. Continuing in the style of The Faceless Ones, Dark Days moves towards a grittier, darker, perhaps more character driven story that will be enjoyed by teens and preteens alike. Derek Landy’s magical world continues to widen its boarders, and nearly every book seems to improve on the last. Let’s see if Landy can continue this feat! 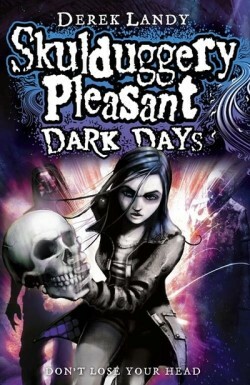 What did you think about Skulduggery Pleasant: Dark Days?